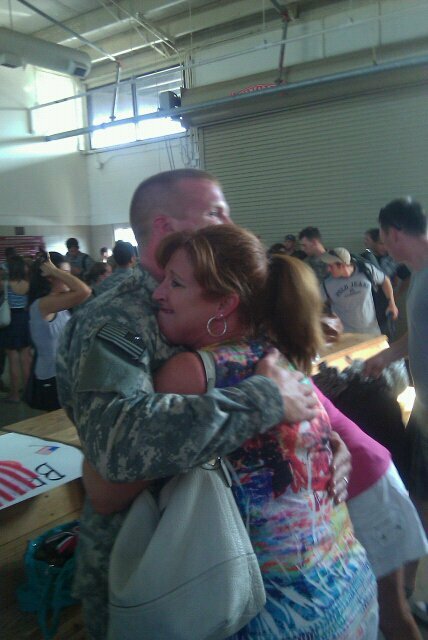 One of our local servicemen returned home (Bahama, NC) yesterday. The young mans parents shared this video with me, so I thought I’d share it with you. Please notice the title too…. Respectfully submitted by SilenceDogood2010 this Twenty Sixth Day of July in the Year of our Lord, Two Thousand Ten. As most of you are aware, there has been quite a debate concerning the Tea Party Movement and racism allegations by our LIARS in Congress. On Tuesday evening, The National Chapter of the NAACP, at their convention, has condemned the Tea Party. Three days later, the plot thickens…. I attended a press conference by Bill Randall on Wednesday outside of the NC State Capital building in Raleigh. Now, another patriot friend of mine provided me with this lady from Georgia. This one is a little long at 10 minutes but well worth the time for your education. Respectfully submitted by SilenceDogood2010 this Sixteenth Day of July in the Year of our Lord, Two Thousand Ten. 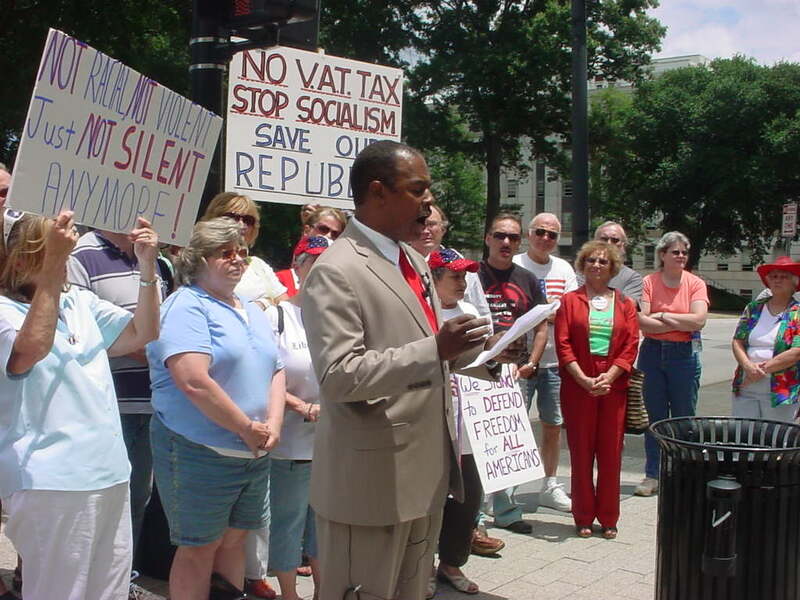 Bill Randall, GOP Congressional Candidate for the 13th District of North Carolina, will hold a Press Conference on the south side of the NC State Capital building, in Raleigh NC at 1:00pm EDT on July 14, 2010. We will be on the Fayetteville Street side of the Capital Building, BTW! If you’re NOT already familiar with this gentleman, here’s one of his more recent addresses…Enjoy my fellow Americans! Respectfully submitted by SilenceDogood2010 this Thirteenth Day of July in the Year of our Lord, Two Thousand Ten. Respectfully submitted by SilenceDogood2010 this Tenth Day of July in the Year of our Lord, Two Thousand Ten. We’re slowly convincing some of ’em, of the EVILS of Socialism, and the insanity of the Liberal/Progressive mind. Any way, back to the trash truck here. This is a captured “garbage truck” captured in Gaza earlier this year by Israeli troops. 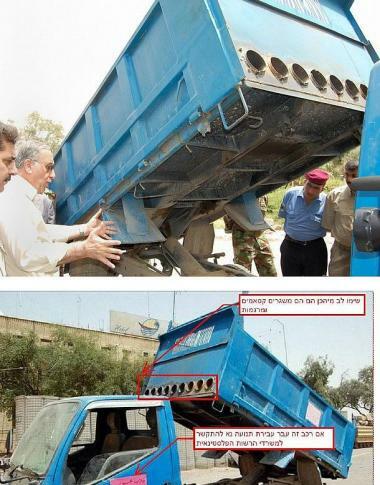 The dump truck is set up to fire nine Kasem “Katyusha-type” rockets and then drive off innocently. The Israelis have evidence of ambulances and emergency vehicles set up the same way. And people wonder why Israel and Egypt BOTH enforce strict quarantines against Gaza. Yes, Egypt does. Many folks conveniently forget that Egypt, a “fellow” Muslim country, enforces a strict embargo against Palestinians in Gaza. I’ll give the Palestinians bonus points for originality…. And now get this folks…… Hizbullah is possibly at our Southern Border working w/ the Mexican Drug Cartels. WE might get to see some of these cute little trucks here in NC. All that going on…. and most of the people are concerned that Lindsey Lohan has to spend 90 days in Jail. Hizbullah might be working with drug cartels on the US-Mexico border, according to a letter cited by Fox News on Tuesday. The letter, writen by Republican congresswoman Sue Myrick to Homeland Security Secretary Janet Napolitano, called on US authorities to set up a special task force to “clamp down” on the threat. A Hezbollah terror cell may be operating among drugs cartels around the U.S.-Mexican border, announced U.S. Republican National Committee Rep. Sue Myrick, according to a Fox News report. Myrick requested that U.S. Homeland Security Secretary Janet Napolitano create a special team to further investigate the potential problem and threat. The Republican representative referenced several incidents that show evidence of Hezbollah’s efforts to infiltrate the U.S. region with the aid of Mexican drug cartel gangs. “It is vital we know what is happening on our border, especially as crime and violence continue to rise there and as terrorist plots and threats are increasing inside the U.S.,” quoted the Fox News report. Myrick cited the warming relationship between Iran and Venezuela as proof that Hezbollah members may be collaborating with Latin American drug cartels, who may be utilizing Hezbollah’s ability to dig underground tunnels for drug smuggling and in turn, providing funding, document forging, and false identities. The Fox News report referenced Anthony Placido, assistant administrator for intelligence at the Drug Enforcement Administration, testifying at a House Oversight and Government Reform subcommittee in March this year, that some drug smugglers in the U.S.-Mexico region have had relationships with Hezbollah between the 1980s and 1990s. “There are numerous reports of cocaine proceeds entering the coffers of Islamic Radical Groups such as Hezbollah and Hamas,” Fox News quoted Placido when he testified to the subcommittee. Placido labeled the proceeds as “easy revenue” that could potentially be used to fund terrorism. Fox News also cited a 2006 House Homeland Security Committee report which details incidents of Hezbollah operatives who were apprehended when trying to access the U.S. through Mexico. The report mentions Mahmoud Youssef Kourani, a Hezbollah member who pleaded guilty in 2005 for supplying information to the terror organization after he was smuggled in the U.S. through Mexico, and lived in Dearborn, Michigan. Respectfully submitted by SilenceDogood2010 this Seventh Day of July in the Year of our Lord, Two Thousand Ten. That title statement is a FACT. Get over it Liberals. John Stossel had a special on FOX News a couple of weeks back. Please take the time to watch, listen & understand the facts he presented. Respectfully submitted by SilenceDogood2010 this Fifth Day of July in the Year of our Lord, Two Thousand Ten. Loretta King the Traitor: She is EVIL folks! Update on 3/27/11 @ 11:30pm EDT: A recent article from the Daily Caller. Here’s a good clip of the New Black Panther Party. Loretta King (no relation to MLK) is one of the evilest people I have ever seen. She is an Assistant Attorney General under the Obama Administration. She was one of the “Powers that Be” that called for the Black Panthers case to be dismissed even though the Department of Justice attorneys have called it a ‘SLAM DUNK’ case of voter intimidation at the polls. Picture of the Traitor, Loretta King. 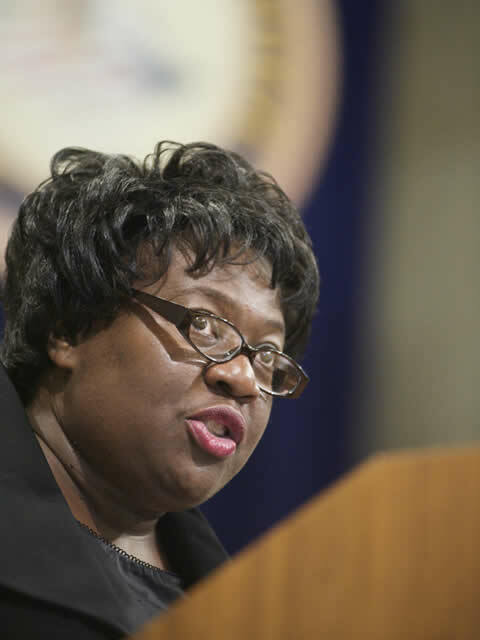 She ordered the State of Georgia to allow Illegal Immigrants to register to vote. I want you pay special attention to the numbers at the bottom of Karen Handel’s letter. Hispanic voter turnout increased by 140% in only 4 years. IF that doesn’t say “VOTER FRAUD”, I don’t know what does! Response to Loretta King’s Letter via the Georgia Secretary of State’s office. Atlanta – “The decision by the U.S. Department of Justice (DOJ) to deny preclearance of Georgia’s already implemented citizenship verification process shows a shocking disregard for the integrity of our elections. With this decision, DOJ has now barred Georgia from continuing the citizenship verification program that DOJ lawyers helped to craft. 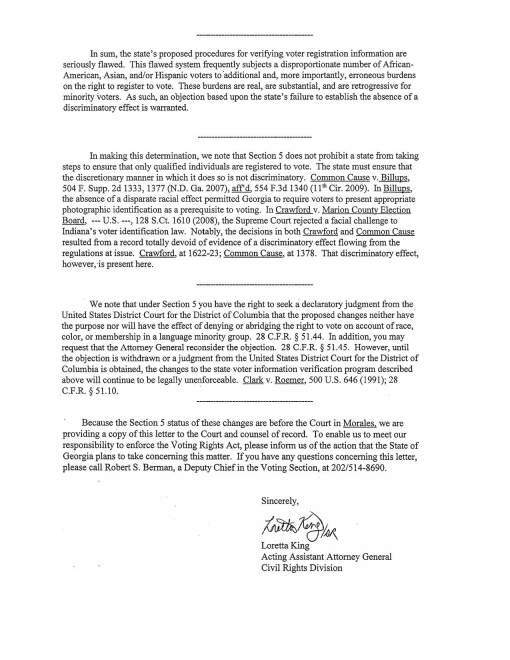 DOJ’s decision also nullifies the orders of two federal courts directing Georgia to implement the procedure for the 2008 general election. The decision comes seven months after Georgia requested an expedited review of the preclearance submission. “DOJ has thrown open the door for activist organizations such as ACORN to register non-citizens to vote in Georgia’s elections, and the state has no ability to verify an applicant’s citizenship status or whether the individual even exists. DOJ completely disregarded Georgia’s obvious and direct interest in preventing non-citizens from voting, instead siding with the ACLU and MALDEF. Clearly, politics took priority over common sense and good public policy. “This process is critical to protecting the integrity of our elections. We have evidence that non-citizens have voted in past Georgia elections and that more than 2,100 individuals have attempted to register, yet still have questions regarding their citizenship. Further, the Inspector General’s office is investigating more than 30 cases of non-citizens casting ballots in Georgia elections, including the case of a Henry County non-citizen who registered to vote and cast ballots in 2004 and 2006. “It is important to underscore that not a single person has come forward to say he or she could not vote because of the verification process. Further, while DOJ argues that the process is somehow discriminatory, the historic voter turnout among Hispanic and African-American voters in the 2008 general elections clearly says otherwise. As required by law and ordered by federal courts in October 2008, the eligibility of new applicants to register and vote is checked against the Georgia Department of Driver Services (DDS) and Social Security Administration databases to ensure that individuals registering to vote report similar information. If information in these databases does not match information reported on the voter registration form, the applicant is asked to clarify the information. Additionally, if the applicant previously reported to DDS that he or she is not a U.S. citizen, that person is asked by a registrar to provide proof of citizenship. 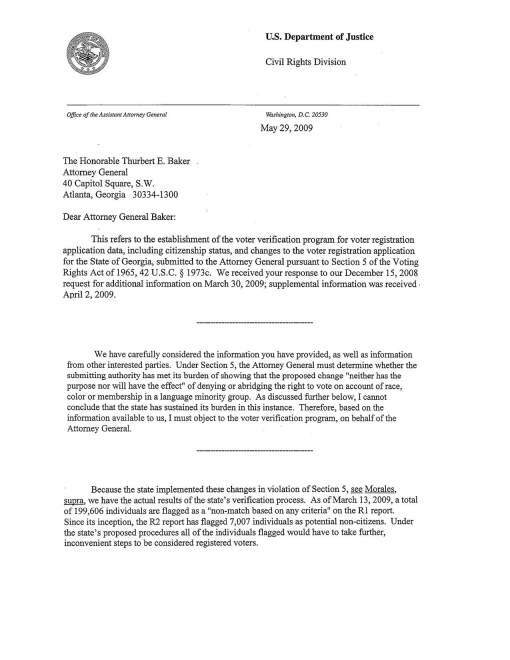 Prior to the November 2008 General Election, Secretary Handel sent letters to 4,771 voter registration applicants whose records at DDS indicated they were not U.S. citizens, asking them to provide documentation of their citizenship. As of March 2009, 2,148 of these applicants still have chosen not to resolve the question about their U.S. citizenship. In the November 2008 General Election, county election officials reported that 599 individuals cast a challenged ballot because the voter had previously indicated to DDS that he or she was not a United States citizen and had not resolved their status with county officials at the time of the election. Of those, 369 ballots were accepted because the voter provided documentation of their citizenship after the election; and 230 were rejected because the individual chose not to confirm his or her citizenship status. On October 10, 2008, activist organizations including the Mexican-American Legal Defense and Education Fund (MALDEF) and the American Civil Liberties Union (ACLU) filed a lawsuit to attempt to prevent Georgia from verifying the eligibility of applicants to register and vote in the November General Election, including whether those individuals were citizens of the United States. Since the possibility of fraudulent and inaccurate voting could significantly injure and diminish the public’s respect and confidence in the electoral process, the State’s ability to maintain reliable voter lists is paramount to a temporary and minor inconvenience to a few individuals. On October 27, 2008, a U.S. District Court three-judge panel again directed the State to continue its voter registration verification process and challenge ballot procedures through the November General Election. The 2008 elections were the largest in Georgia’s history, featuring record turnout among minority voters with the citizenship verification program in place. The figures below represent voter turnout statistics among Hispanic/Latino, African-American and White voters from the 2004 and 2008 General Elections. Karen Handel was sworn in as Secretary of State in January 2007. The Secretary of State’s office offers important services to our citizens and our business community. Among the office’s wide-ranging responsibilities, the Secretary of State is charged with conducting efficient and secure elections, the registration of corporations, and the regulation of securities and professional license holders. The office also oversees the Georgia Archives and the Capitol Museum. Respectfully submitted by SilenceDogood2010 this Third Day of July in the Year of our Lord, Two Thousand Ten.